Chris Pratt is addressing claims made about his church. Last week, actress and activist Ellen Page took to social media to respond to a tweet about Pratt and his appearance on The Late Show. “Fresh from fasting, @prattprattpratt talks about his spiritual side on @colbertlateshow,” the tweet from The Hollywood Reporter read. After seeing the social media reaction to her tweet, Page followed it up with a second post. According to reports, Pratt attends Zoe Church in Los Angeles, which is led by pastor Chad Veach. In a March 2018 profile with the New York Times, Veach shared that he modeled his church after Hillsong, a contemporary Christian church founded in Australia in 1983 by Brian Houston and Bobbie Houston. 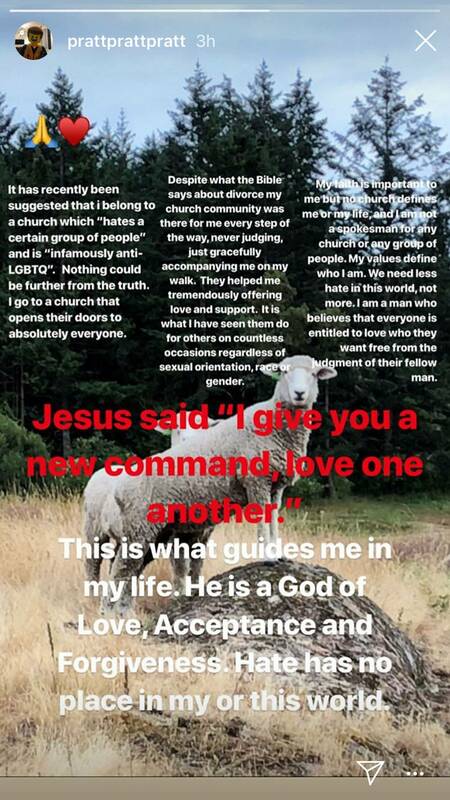 After hearing the claims made about his church, Pratt took to Instagram Story on Monday to respond.